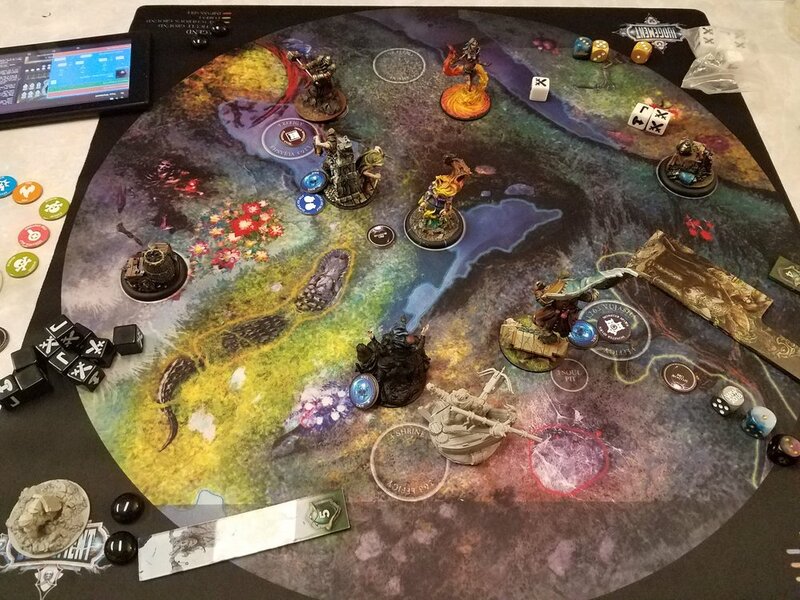 I was fortunate enough to have another game of Judgement this weekend, and for a change of pace we opted to play on the Swamp mat rather than the Cobblestone map. You can find that first report here, and if you haven’t read the Overview of the game yet I suggest doing that so that this report is easier to follow along with! The Swamp map is the much more involved scenario out of the two 3v3 maps. The Vujasha (the Monsters in the scenario) are extremely deadly and activate every time that a soul is harvested, whether through Soul Gazing or by killing an enemy hero. This can lead to some extremely complicated turns, where Soul Gazing disrupts your own plans or can be used to add a ton of damage to a turn against your opponent. I only have one Vujasha built as of now, so Megalith is standing in for her on the far side of the map. Additionally, there is a TON of rough terrain on the map, and the Vujasha’s get faster if they are in rough terrain. I particularly like that the Crocodile is hazardous ground, which is terrain that slows you down 2 inches and damages you when you enter or move around in it. 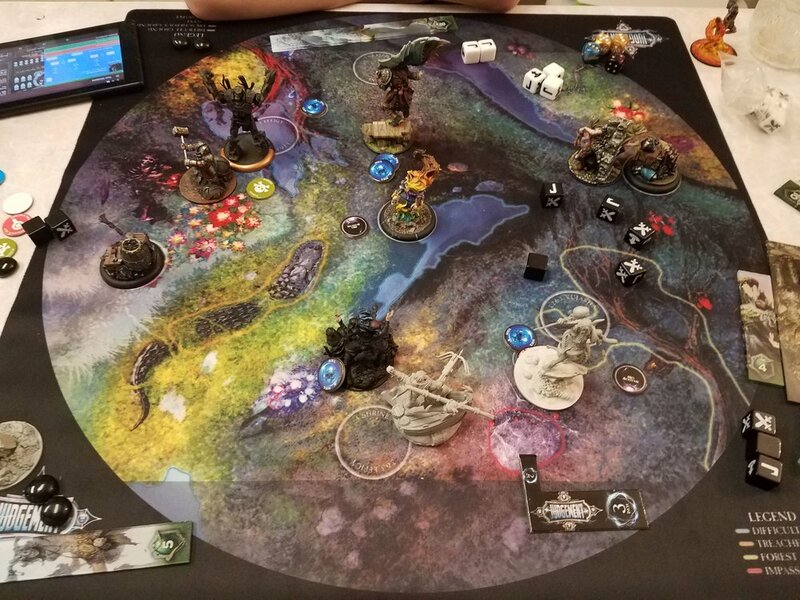 Another interesting feature, the Effigies are off centered and closer to the middle of the table in most of the Scenarios, which means that you have more deployment room and also that your Effigy is more exposed to attack. I have some sweet Effigies in progress right now, but it’ll be probably another report before I’ve got them made. One final thing (this map is nuts). The shrine in the middle, rather than just giving d3 fate to whoever controls it, gives a fate, heals a friendly hero, and shoots the closest enemy model within 8 with a really nasty gun. The Shrine is a special shrine to the Water God Wellin. A final thought on the Swamp Mat - it’s flipping gorgeous. My brother picked a very similar Warband to last time, with Barnascus not showing up simply because he is on my painting table at home. Piper is a bit of an all rounder. He has a high AGI stat of 5, so he’s fairly difficult to hit and do damage to. He’s reasonably good at Soul Gazing, and has some pretty vicious melee potential if another friendly hero is engaging his target, as he gets +1 to his damage when that happens. He also can ignore 1 attack a turn and place himself within 2 inches of his starting point at the beginning of his turn. Istariel is one of the most dangerous aggressors in the game, ignoring 1 RES with every attack and having the ability to light enemies on fire and keep them that way. She has a sweet teleport ability which keeps her shooting every turn, and she also has the typical high Elf AGI of 5. Thrommel is a Defender and has an impressive RES of two, meaning that he ignores the first two damage of every hit he takes. His hammer does insane amounts of damage, but with the trade off that he can only swing it once per turn maximum. I brought a little Warband that I’ve been theory crafting a fair bit as something to try. 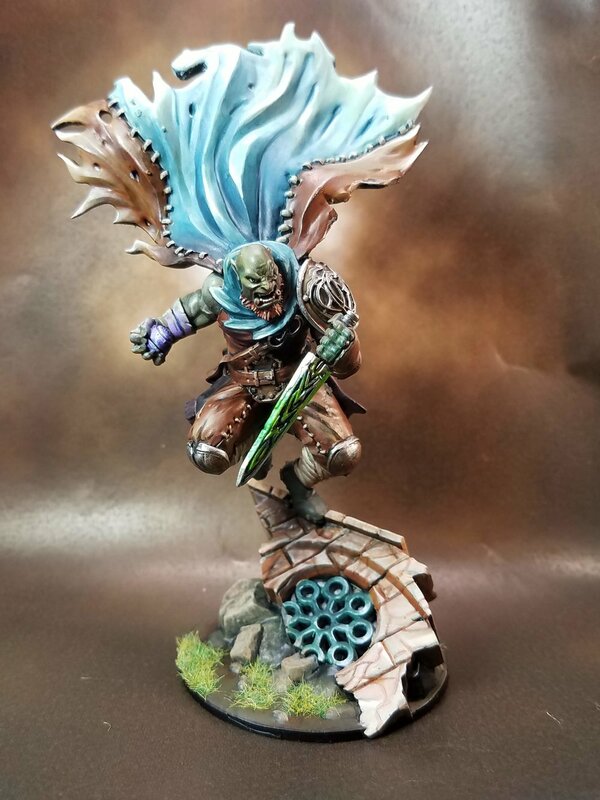 Rakkir is one of the most impressive models in the game, standing over six inches tall with his cloak. He has the ability to put down Shadow Orbs and use them to teleport around with them. He also inflicts Poison on enemy models and then has a Fate ability that can do 2d6 True Damage to them. Zaffen is a bit like Thrommel in that his primary weapon requires two actions to use. Unlike Thrommel, however, his Crossbow gets cheaper to use if he fires it once. This means that if he aims and shoots without moving, he can get two shots and they have a pretty impressive damage output. Additionally, Zaffen can poison people with the Crossbow which synergizes quite nicely with Rakkir. Zaron is a Soul Gazer who can summon skeletons, and he can Soul Gaze through these summoned guys which is incredibly potent. Being able to run a skeleton halfway across the map and then Soulgaze from safety is a big deal for a squishy character like him. I won the roll off and opted to go first! We both generate a Fate since it’s the first turn. No souls spawn because it is Turn 1, and I get going with Zaffen. Zaffen aims and shoots at the Vujasha. She is AGI 5 and in soft cover so effectively 6. Zaffen aims to 8, and with his two dice shot he does 3 damage and pushes himself an inch forward. His second shot nets me two pushes and Zaffen scoots forward. Istariel teleports up to get in range of the other Vujasha, and shoots it twice, leaving it on 8 health. The high AGI stats of the monsters are making both of us sad here. My plan here is to be able to kill my Vujasha with Rakkir’s charge so that he can advance forward afterwards. In order to do that, I need to do a little more chip damage. Zaffen moves twice to contest the extremely powerful Shrine of Wellin, and puts a magical blast into the Vujasha, doing two more damage and leaving it on five. Thrommel charges in on the Vujasha, getting a total of three dice to hit and nailing a critical hit for 7 damage. He uses Thrommel’s Fate ability to do d3 more damage to the monster which kills it, leveling Thrommel up, spawning a Soul, and giving up a Fate. Finishing off my turn, Rakkir charges the Vujasha and I roll the Crit needed to kill it. This levels him up and gets me a second Fate. Looking across the table, I see a whole bunch of AGI 5, so I opt to buy the Vorpal Blade to make Rakkir MEL 8. It is not much help against the Vujasha’s, since they ignore all magical item effects, but it is critical against the Elves. Rakkir then puts down a Shadow Orb and uses his third action to advance forward. Piper finishes off the round by phasing forward two inches, walking twice to contest the Shrine, and putting up Duplicate Self. The Souls on the table move towards the closest heroes, and the Vujasha’s prep to respawn next turn. 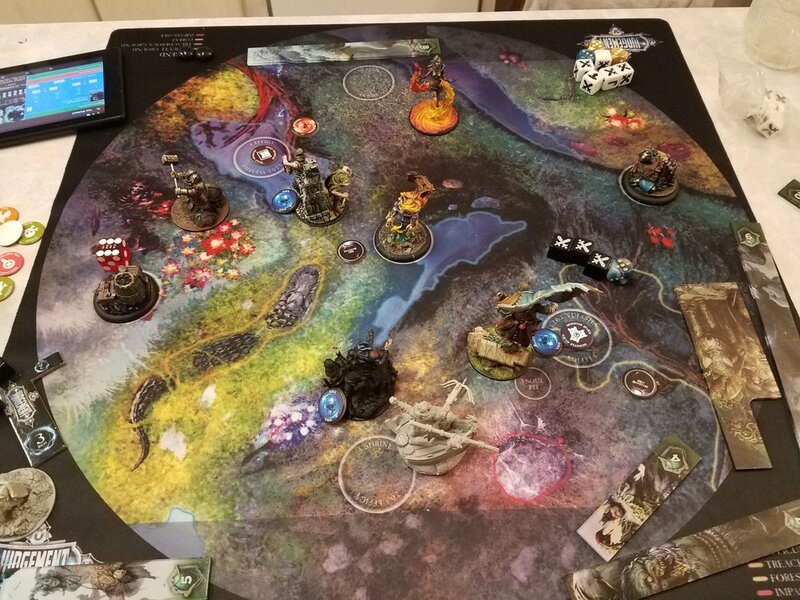 A Soul randomly spawns next to Rakkir, which I am now realizing should not have happened since there were two souls on the table already (basic rules are hard guys). Zaron puts down a Shadow Orb, and then walks backwards to Soul Gaze the illegal soul. He absolutely had range to the other Soul, so I do not know if the outcome of the game was affected too much by this. Piper phases towards the Soul and successfully takes it, leveling him up. He then puts up Duplicate Self to ignore the next attack. Zaffen aims again, going to RNG 8 against Piper’s AGI 5. The first shot is ignored due to Duplicate Self, but the second shot rolls three hits for a Crit! I then use Zaffon’s fate ability Big Game Hunter to do an additional d6 True Damage and roll a 5, bringing Piper down to two health. Taran actually has a cute thought here, which involves charging my Effigy with Thrommel, and then shooting it twice with Istariel. If he rolls crits on all three attacks and Piper doesn’t die, I instantly lose as my Effigy will take 12 damage. Thrommel charges in and lands the crit! My Effigy drops to 6 health remaining. Rakkir plops down a Shadow Orb and then teleports up to the one Zaron put down earlier this turn. This lets him charge Piper, and thanks to the Vorpal blade I get the single hit I need in order to kill Piper, bringing the Soul Count to 2 - 0 in my favor, and with the lost Soul my effigy pops back up to 10 health. Istariel, now unable to kill my Effigy, pumps 3 shots into Rakkir, doing 6 damage and lighting him on fire. I think the third shot was probably a mistake, because now he is not contesting the Shrine. The soul moves a bit, another Spawns, and the Vujasha’s show up. I get three Fate to none, and the Effigy shoots Istariel for five. Piper respawns as well. Rakkir starts things off, using a fate to knock the Fire off and charging Istariel. I screw up my order of things here. The charge Poisons her, but instead of using Toxin to kill her (she’s on five) and porting back to the Effigy with a Shadow Orb, I opt to attack again and try for a Symbol to port back and save a fate. I end up having to use Toxin anyway, and now Rakkir is on 11 boxes in charge range of both Piper and Thrommel. The Vujasha’s both activate since I bound a Soul, the far one hitting Thrommel and the close one almost getting to Zaffen. Thrommel takes a Free Strike to charge Rakkir, rolling a critical hit and then max damage on his Fate ability to leave the Orc on 1 health. Zaron moves over and yanks the Soul, bringing me to 4 and ending the game. Not contesting the Shrine was huge this game, and I think that in this particular instance moving Piper back would have been safer than putting up Duplicate Self. That being said, I did roll extremely well (as did he), pretty much rolling every critical hit and never failing a Soul Gaze. 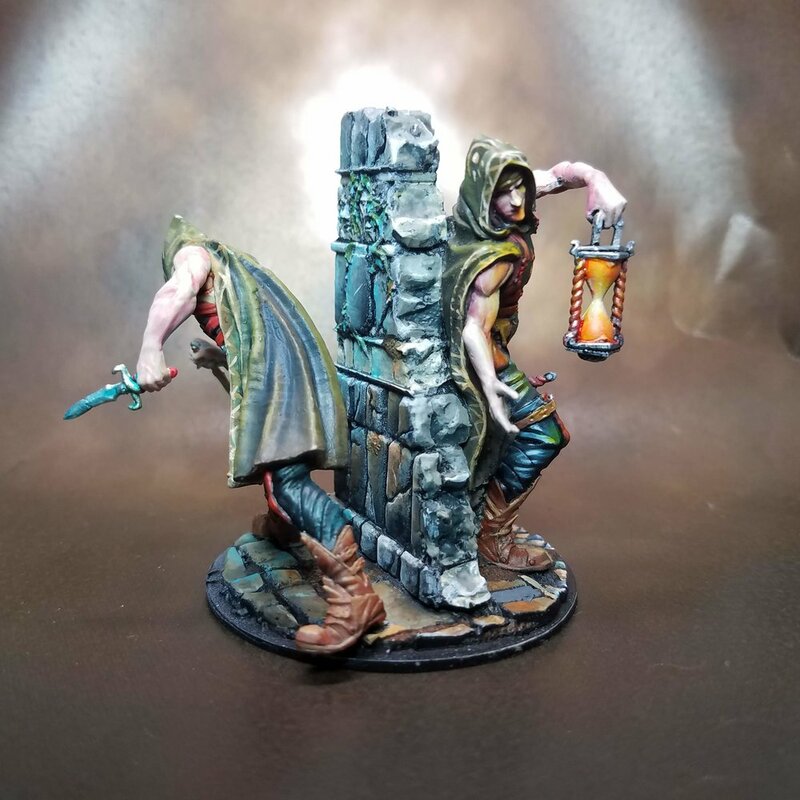 I really liked the tricks this Warband has - the Shadow Orbs coming down from multiple models is very strong. My brother feels like he really wants Barnascus back, simply because the Dwarf and his Tank are much harder to kill and have close to the same output as Istariel. Thanks for reading everyone, see you next time!